On Friday, Dec. 21 at 8:30 a.m., the bells of Samford University’s Rushton Memorial Carillon will toll 26 times in memory of the victims of the Sandy Hook Elementary School shooting in Newton, Conn.
Samford carillonneur Steve Knight will perform the service as part of a memorial observation that will enlist the bells of colleges and churches throughout the nation. The Rushton Memorial Carillon, so familiar to Samford students from the late 1960s through the present, is among the finest in the nation. The 49 bells of the original set, together weighing more than five tons and covering four octaves, were cast in Asten, Holland, at the renowned Schulmerich-Eljsbouts Bell Foundry. 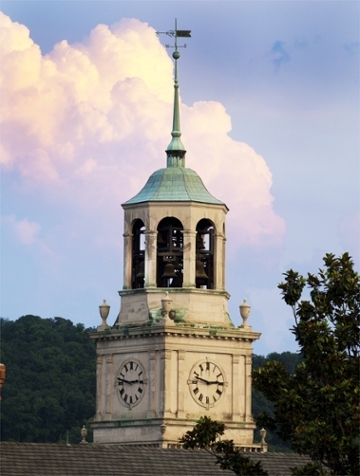 The carillon was first installed in the bell tower of the university's Reid Chapel in 1968. It was expanded and relocated to the library’s bell tower in 1979.